I am not a vegan or even a vegetarian, but I often like to eat that way. If you do, too, then you’re gonna love this spicy bell pepper bulgur bowl, which becomes vegan when vegetable stock is used in place of chicken stock. The decision to use mint, cumin, pine nuts, parsley, and golden raisins was inspired by Moroccan dishes I’ve cooked in the past, and they lend an exotic flavor to the plain-Jane (yet pleasant-tasting) bulgur. Bulgur is one of those awesome whole grains that has been getting press lately; it’s made from pre-cooked durum wheat and is packed with protein, fiber, and minerals, making it an excellent alternative to rice, pasta, or couscous (Sigh – couscous. I still miss it. I was obsessed with it for years until I read The Sugar-Smart Diet and realized that it, like pasta, is made of flour and therefore acts like sugar in the body – booooo. But I digress.). 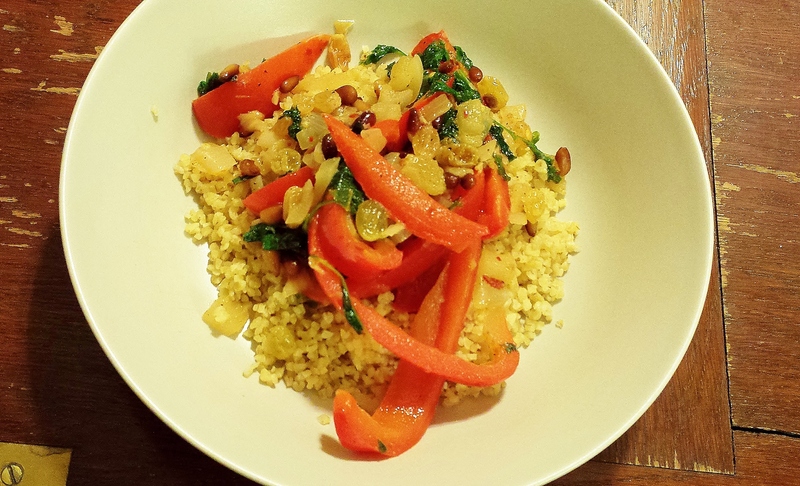 I eat bulgur a lot; it’s filling, simple to prepare, and very versatile. And after trying this recipe, perhaps you will, too. Combine bulgur and two cups of the stock in a medium-sized pot, bring to a boil, then reduce heat to a simmer, cover, and cook 10 minutes, or according to package instructions. When done, remove from heat. While bulgur is cooking, add sliced red bell pepper and diced onion to a large pot that has been drizzled with two tablespoons of grapeseed oil. Over medium heat, cook for six minutes, stirring frequently so that the onions are lightly browned and the bell peppers are softened. During the last few minutes of this step, add the pine nuts and the remaining two teaspoons of grapeseed oil to a small pot over medium heat and cook until the pine nuts are lightly browned. This should only take a minute or two; I’ve learned the hard way that toasting pine nuts requires quick timing and constant stirring to ensure that they don’t burn! Once toasted, dump them immediately into the pot with the onion and red bell pepper. Reduce heat to medium-low, then add the golden raisins, minced mint leaves, minced parsley, lemon juice, red pepper flakes, cumin, black pepper, kosher salt, and the remaining half cup of stock. Mix well and let cook for another two to three minutes. Then divide bulgur evenly into bowls and spoon the pepper-onion mixture over it. Makes three to four scrumptiously flavorful bowls.